The Doctor of Philosophy (PhD) is the University's highest qualification. The degree is undertaken by research only and leads to advanced academic and theoretical knowledge in a specialist area. The PhD is suitable for students who want to pursue an academic or research career, or a senior position in the public or private sector. Doctoral studies present you with the opportunity to generate new ideas that can benefit business and society. You will make a significant original contribution to knowledge and understanding in your field of study and meet recognised international standards for your work. 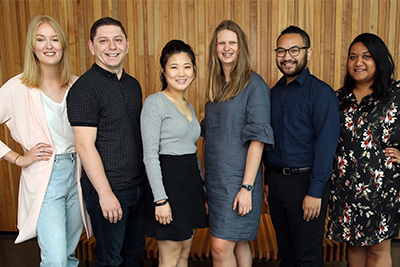 AUT's academic supervisors are recognised world-class researchers in their fields who have the expert knowledge to guide and advise you throughout your PhD. This represents the approximate tuition fee based on a full-time workload of 120 points in 2019. The fee shown is for candidates conducting the majority of their study within NZ. Where the majority of studies is conducted outside NZ an international tuition fee of $36,950 will apply. The degree must normally have been gained at the standard of first class or second class (first division) honours from this University or a recognised equivalent. The degree should include advanced learning in research, execution of a research project and a written report on the research. Prospective PhD applicants are required to prepare a formal research proposal, specifying the field of research and a general research question you wish to investigate. Doctoral students will attain the knowledge, values and attributes to make significant contributions to their professional communities and societies through further high-quality research, and developments. You put together a proposal that critically reviews work done in your area of research. This requires a suitable research methodology and a timeframe for completion of the degree. You are expected to publish one or more papers for a reputed international conference in your chosen area of research. Once you have completed your research proposal, you refine your design, collect data and conduct your research as appropriate. Data is collected and analysed and the results are published at international conferences. A journal publication is also encouraged at this point. The first step in the final stage of the PhD is finalising the data collection and analysis. You then write your PhD thesis and submit it to the supervisor for feedback. It could take two or three drafts before the thesis is ready for submission and examination. The outcomes for graduates of the Doctor of Philosophy are outlined in the Graduate Profile below. It is expected that graduates with a Doctor of Philosophy will have gained the necessary skills and qualifications to follow an academic or research career. Alternatively, your research topic may lead you to a position of expertise in your chosen field. The opportunities to apply the knowledge and skills you gain through a PhD will be extensive, both in industry and academia.